Transition Gallery has partnered with the William Morris Society at Kelmscott House, Hammersmith, to organise a special exhibition for the first Hammersmith and Fulham Arts Festival. William Morris was an artist, writer, printer, designer-craftsman, environmentalist and political activist and lived at Kelmscott House from 1878 until his death. The exhibition draws on this unique location to combine contemporary painting, drawing, photography, film and sculpture with highlights from the William Morris Society collection. News from Nowhere takes its title from William Morris’ utopian novel and vision for a future free from capitalism, alienation and industrialisation. In our current climate of political uncertainty, ‘disappearance’ of the working classes and shifting populations, Morris’ longings for a better world seem more pertinent than ever. Morris became increasingly involved in political activism and founded the Hammersmith Socialist Society in 1890, which held Sunday evening lecturers in the Coach House at Kelmscott House, Hammersmith. The location is directly referred to in News from Nowhere and the exhibition will take place in this historic space. Morris also set up carpet looms in the Coach House before moving Morris & Co.’s workshops to Merton Abbey in 1881. Morris’ desire to see an end to mass production and return to small-scale local production seems like a modern concept. His socialism was imbued with environmentalism and understanding of the brutalising nature of the modern city. Whilst his idealised vision may have been unattainable, his passion is inspiring and the exhibition will bring into focus his vital message, to dare to dream. Incorporating works from the William Morris Society collection, News from Nowhere picks up the dialogue where ideas about the environment, idealised society, personal longings and dreams for the future continue to yearn, seethe, simmer and provoke. Benjamin Bridges makes paintings that combine elements of geometry, brutalist architecture and Dutch Golden Era painting with ideas of the sublime. Futuristic imaginings are also carefully rendered through the filter of sci-fi literature. Solo exhibition Pythagoras Adrift, dalla Rosa Gallery, London 2014; Encounters, Caroline Kha,London, 2013. Group exhibitions include Someshta’s Garden, Vibe Gallery, London 2014; Threadneedle Prize, Mall Galleries, London 2013; Look, See and Tell, Kring Space, Amsterdam, 2013. Matthew Cowan works in the realm of traditional European customs and his works play with the inherent strangeness of the continued popularity of long established folk customs in a modern world. In 2009 Cowan was the artist in residence at Cecil Sharp House, the headquarters of the English Folk Dance and Song Society. 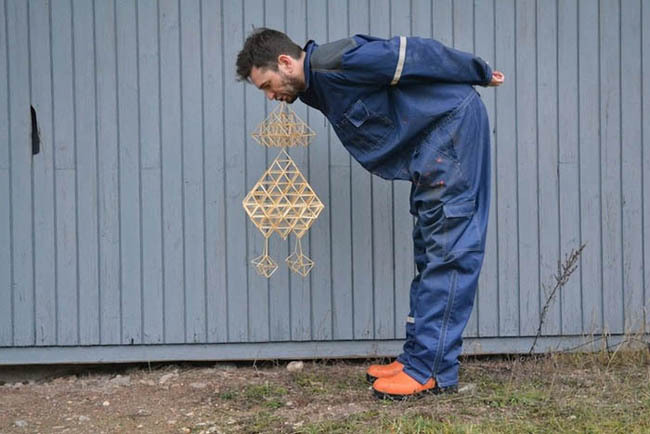 Solo exhibitions include Flowerbeard, Te Tuhi, Auckland, 2013, The Trees are Thick with Butter, Nurture Art, New York, 2013, The Island of the Day Before, Agency Gallery, London, 2012. Selected group exhibitions include Unstuck in Time, Te Tuhi, Auckland, 2014; Mannequin, Lopdell House Gallery, Auckland 2014; Body Rock, New Zealand Film Archive, Auckland, 2013; Travelling Art, 500m Gallery, Sapporo, Japan, 2013; Rituals are Tellers of Us, Newlyn Gallery, Cornwall, 2013. Annabel Dover explores the social relationships mediated through objects, revealing the personal narratives we impose upon them. She is a current PhD Fine Art student at Wimbledon College of Art, London. 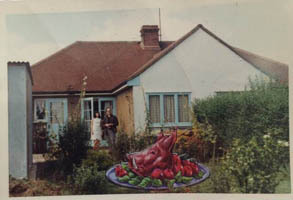 Recent exhibitions include Contemporary Art from IWM: Art in a Media Age, Imperial War Museum North, Manchester, 2013; His Monkey Wife, Glasgow Project Room, Glasgow, 2013; This Me of Mine, touring Strange Cargo, Folkestone, Kaleidoscope Gallery, Sevenoaks, Ipswich Art School Gallery, Ipswich, 2013. Debbie Lawson graduated from the Royal College of Art, London and her sculptures, rugs and wooden panels take a psychological journey of the domestic interior. Recent exhibitions include Make Believe: Re-imagining History and Landscape, Nottingham Castle Museum and Art Gallery, Nottingham, 2013; Ha Ha Road, Oriel Mostyn, Llandudno, 2012; Contemporary Eye: Crossovers at Pallant House Gallery, Chichester, 2011. Cathy Lomax reconfigures popular and obscure icons from English history and contemporary culture to produce groups of paintings combined with other elements. 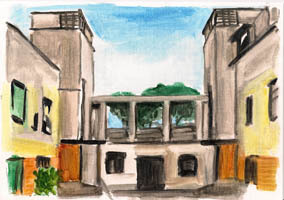 She is currently resident Abbey Painting Fellow at British School of Rome, Italy. Solo exhibitions include Glass Menagerie, B&B Projects, Folkestone, 2011. Group exhibitions include Stowaway, Weekend Gallery, Los Angeles, 2014; Wintergarden, Sutton House, London 2013; Ornament, huntergather, London, 2013; Masque, Galerie d’YS, Brussels, 2013; The Unknown Sitter dos, Charlie Dutton, London, 2013; Misdirect Movies, touring Royal Standard, Liverpool, 2013; This Me of Mine, touring Ipswich Museum. 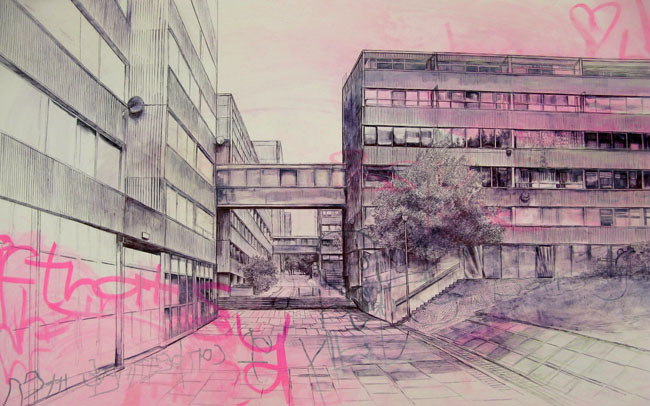 Laura Oldfield Ford is currently resident artist at Stanley Picker Gallery, Kingston University. Her work is concerned with issues surrounding contemporary political protest, urbanism, architecture and memory. Recent exhibitions include Ruin Lust, Tate Britain, London, 2014; Recording Britain, V&A touring, 2014; Comics Unmasked: Art and Anarchy in the UK, British Library, London, 2014; Soft Estate, touring Bluecoat, Liverpool, 2014 and Spacex, Exeter, 2014. Alex Pearl makes films, video installations, sculpture and books with a sense of acceptance of failure or disappointment as part of the human condition, displaying playfulness and a hopeless desire for greatness. Solo exhibitions Mothra vs Godzilla, CANAL, London, 2014; Let’s Go! Fishmarket Gallery, Northampton, 2012; Whitstable Biennale, Whitstable (commission) 2010. Group exhibitions include East Contemporary Art, Waterfront Gallery, UCS, Ipswich 2013; One Minute, Volume 7, De La Warr Pavillion, touring 2013; The End of the Future, Transition Gallery, London 2012. Alli Sharma takes an ambiguous glance at her own history to make paintings that examine ideas about identity, class and taste. Group exhibitions include John Moores Painting Prize 2014, Walker Art Gallery, Liverpool, 2014; (detail), H-Project Space, Bangkok, 2014; Stowaway, Weekend Gallery, Los Angeles, 2014; Wintergarden, Sutton House, London, 2013; Painting Past Present: A Painter’s Craft, Laing Art Gallery, Newcastle, 2013; Masque, Galerie d’YS, Brussels, 2013. Mimei Thompson’s paintings are a reflection of an internal world where the natural always exists as a construct. Solo exhibition Lunar Asparagus, Art First, London 2013. Group exhibitions include Stowaway, Weekend Gallery, Los Angeles, 2014; Circus TM, Belmacz, London, 2014; Wintergarden, Sutton House, London, 2013; The Dream Machine, Sluice Art Fair, London, 2013. Mark Titchner explores the tensions between the different belief systems that inform our society, be they religious, scientific or political. Solo exhibitions include Please believe these days will pass, Art Gallery of Ontario, Toronto, 2012; Ends Thou, Focal Point Gallery (offsite), Southend, 2012; Be true to your oblivion, New Art Gallery, Walsall, 2011. Group exhibitions include 52nd Venice Biennale, Venice, 2007; British Art Show, London, 2006. He was nominated for the Turner Prize in 2006 and was Artist in Residence at the Art Gallery of Ontario, Toronto in 2012. Joel Tomlin works sculpturally with wood and bronze, often with painted or patinated surfaces in order to create an internal, Arcadian world. Influenced by Arte Povera, animals, plants, legend and story emerge to give a sense of archaeology, both human and personal. Recent group exhibitions include Lions on Water, Balmacz Gallery, London, 2013; Selected Paintings and Sculpture, Kronach, Germany, 2013, Parallel Universe, Charlie Dutton Gallery, London 2012, Ever since I put your picture in a frame, 42 Carlton Place, Glasgow, 2012.